Margaret Macdonald was one of the most gifted and successful women artists in Scotland at the turn of the century. Her output was wide-ranging and included watercolours, graphics, metalwork and textiles. Arguably her greatest achievements were in gesso, a plaster-based medium, which she used to make decorative panels for furniture and interiors. Macdonald was born in England and came to Glasgow with her family around 1890. She enrolled as a day student at Glasgow School of Art where she met Mackintosh and Herbert McNair. She left the School in the mid 1890s and set up an independent studio in the city with her sister, Frances. Margaret Macdonald The sisters worked together until Frances’s marriage and departure for Liverpool in 1899. Mackintosh and Macdonald married in 1900. 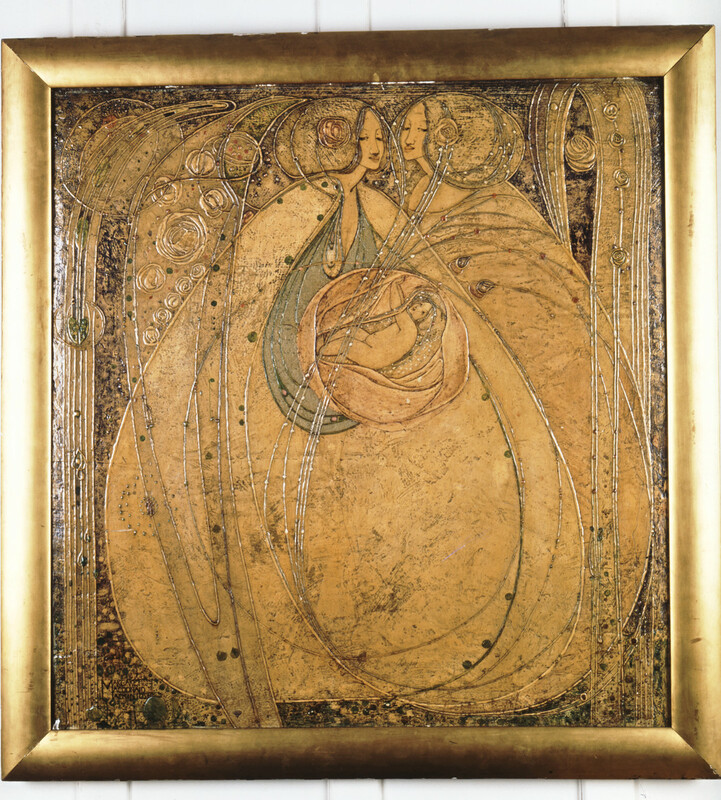 Collaboration was key to Margaret Macdonald’s creativity. The partnership with her sister in the 1890s produced metalwork, graphics, and a series of book illustrations. Her collaboration with Mackintosh comprised primarily the production of panels for interiors and furniture, notably for the tea rooms and The Hill House. The precise nature of their partnership is difficult to define, because little documentation survives. However it is certain that Macdonald played an important role in the development of the decorative, symbolic interiors of the early 1900s, including the House for an Art Lover portfolio, the Rose Boudoir, Turin and the Willow Tea Rooms. Ill health and the strain of Mackintosh’s declining career contributed to a decline in her own output and no work after 1921 is known. Macdonald died in London in 1933, five years after her husband.